The Center for Youth Program Quality (CYPQ) produces several assessments that are used to evaluate the quality of out-of-school time organizations such as after school programs. accounts, and export the collected data for use in other applications. 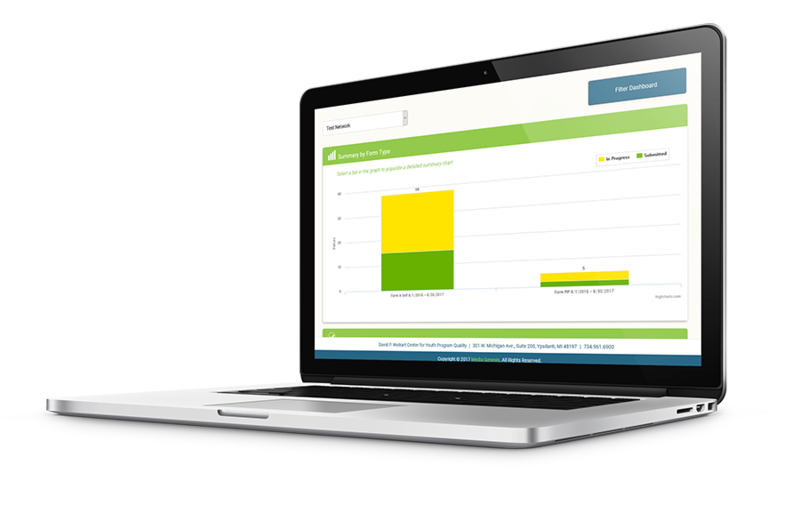 A Dashboard built into the Scores Reporter provides quick access to data about the completion rate of assessments. The Assessment Editor is one of the most powerful features available to CYPQ. It allows for the creation and maintenance of assessments and other forms. Each question in an assessment has a number of editable properties to affect how data is entered into that question and how that data is displayed in reports. A front matter for a report generated by the scores reporter system. A “Front matter” shows what the report is, how to read the report and ideas on how to interpret the data in the report. The front matter is produced from a HTML file, allowing new report cover pages to be created using standard technologies. Most reports contain a bar graph which issued to compare the different data sets in the report. In addition to a graph, tables break down the data in reports into various degrees of detail. The Scores Reporter provides three levels of report generation. Shown in the example is the basic reporting, which is designed for easily comparing small amounts of data. Every user of the system can access an interface to view and edit relevant assessments. This page also contains a set of tools to filter the list of assessments by several types of attributes. Interested in learning more about this Case Study?